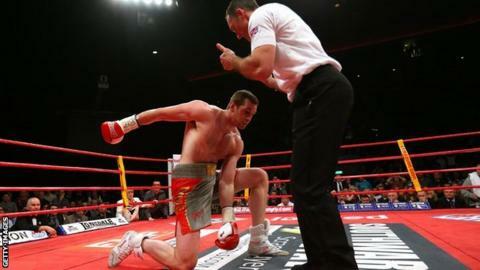 Tony Thompson says Britain's David Price will still become a heavyweight world champion - despite the American's shock victory in Liverpool on Saturday. He said: "I told David I think he will wind up being a world champion." Price added: "It is disappointing but it is not the end of the world. I will come back stronger." Thompson has twice fought and lost world title bouts against Wladimir Klitschko. The American said: "If you stay in this game long enough, and you're not Rocky Marciano, you are probably going to lose. The fight had barely started when Price's evening was brought to a shuddering end. After a cagey opening round, Price had started to open up when, after failing to connect with a right hook, he was caught with a counter-punch to the side of the head. He was sent crashing to the canvas and, after struggling to regain his composure, was counted out by the referee. "It is one of those things in heavyweight boxing," said Price. "It was a funny shot which perforated my ear-drum, took my balance away and scrambled my senses. "It wasn't that big a shot, it was where it caught me that did the damage. It was disorientating." Price still expects to fight his way to the very top. He added: "I am still the British and Commonwealth champion and two or three fights down the line this fight will be ancient history and I will be back talking about world titles. "I will probably go back to knocking people out in one or two rounds - one punch doesn't change everything. "Of course it knocks me back, we have to be realistic as it is a big setback. We have a good team around me who can rebuild me. "It is definitely a learning curve, it is heavyweight boxing and things happen. I've been knocking people and now it has happened to me." Price says he would be keen on the possibility of a rematch with Thompson, but the American said he would rather fight another British fighter next - Tyson Fury, who has yet to be beaten in 20 fights. "They can talk all they want about a rematch, I am not coming over here again," said Thompson. "They vastly underpaid me for this fight and I took this fight because of the opportunity. I have created my own opportunity now so if they want to fight me again, they have to come over to my side of the pond and pay me what I am worth. "I want to fight Tyson Fury next. I wouldn't even put him in the same league as David Price." He stands by those quotes, and also defended himself against suggestions that he was not as trim as his opponent. "I wasn't overweight," said Thompson. "I have been heavier in plenty of other fights. "I didn't mind them drug-testing me. All they were going to find was doughnut juice and fried chicken. How can you look at my belly and tell me I am on something?" Price's promoter Frank Maloney was released from hospital on Sunday. He collapsed after the fight, but Price told the BBC he was "fine".